I am ashamed to say I did not know who he was until his nephew Munir presented his poems at our bi-monthly poetry evenings in London. He passed away in Gaza a few weeks ago after a life of struggle with both the pen and the rifle. 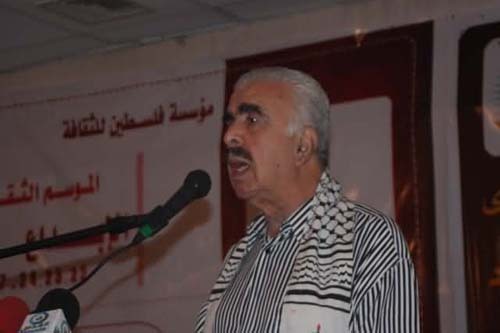 Nahid Munir al Rayes was of the old-school Fatah guard, and he worked closely with the late Abu Jihad in the sixties and seventies as well as numerous other Palestinian revolutionaries. His life was spent between Gaza, where he was wounded whilst trying to defend it in 1967, as well as Jordan, Lebanon and Syria. In 1994 he finally came back, reluctantly, to Gaza to serve as a judge and official in the government. After falling out with personalities such as Muhammad Dahlan and becoming disillusioned with what Fatah had become, he resigned and ran as an independent in the elections which saw Hamas sweep to power. A highly respected figure by both sides, he was offered a position as mayor of Gaza by Hamas, but declined the offer in order to spend his remaining years writing prolifically. Even whilst incapacitated by illness and on his deathbed, he continued to dictate his words to his sons. Urbane, sophisticated and yet also comfortable in struggling with the masses and the common people, one of his inspirations was Che Guevara, whose book Guerrilla Warfare he translated into Arabic. Mr Nahid al Rayes also grew devoutly Muslim as he progressed in age, and inspirations from his Qur'anic readings glimmer in his poems with startling elegance. Always suspicious of Oslo, he was in two minds as to whether to return to Gaza, but decided in the end that, regardless, he would much prefer to be buried in his own land than in exile. Even as an old man, he continued to provide assistance and help as much as he could. Even as an old man, his struggle continued, sometimes unknown even to his family. At his wake they were surprised to hear by other people that he had been seen with his hands up against a wall, lined up with other men caught supplying people with blankets, food and supplies during the Israeli war against Gaza last year. An amazing man with an intense and vibrant spirit, he will be sorely missed I am sure, but fortunately his writings are still there for us to be inspired by. The poem below is one in which he reflects on his life of struggle and his hopes and aspirations for Palestine.